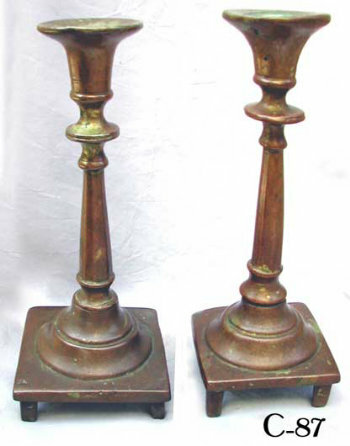 A pair of heavyweight brass Sabbath candlesticks, c. 1770. Bladed, faceted stems, on square footed bases, the candleholder of flared krater shape. Hand made and hand finished with irregularities common for their manufacture. Original cinnamon patina with dappling of yellow and green.